Because each Miraval Moment is unique, we are expanding our Instagram #MiravalMoments to tell our guests’ special stories on our blog. We love hearing about your Miraval experiences, from personal triumphs to quiet moments of reflection. We encourage you to read these stories with the hope that they might spark a memory of your own journey. Perhaps they will inspire you to try something new on your next visit. To share your story, please email MarketingTeam@miravalresorts.com. There is something about standing on a tightrope 35 feet in the air that makes you think hard and fast about balance. 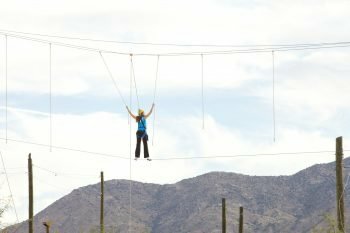 The Desert Tightrope is one of Miraval’s Challenge Course activities that invites people to step outside their comfort zones and into the great outdoors. The idea is to climb 35 feet up a pole, step out onto a tightrope and walk across it. You’re not expected to be an acrobat – You are in a full harness, and can hold onto ropes suspended above you for balance. The activity is meant to go something like this: You take the first step onto the cable and step away from the pole – which is your safety – and you have to actually let go of it. Everyone grasps it for dear life at first. People hold on as long as they can, stretch their arm as far as it will stretch, then slowly inch out onto the cable. There’s a rope there but you have to really stretch to reach it. So now you’re holding the rope with one hand and your other hand is still on the pole – by a fingernail – and you must let go. You keep inching across to the next rope. So now you are holding a rope in each hand. You continue to move across to another rope by letting go of the last one. Some of the ropes are further apart from each other. Some don’t dangle down as far. Group leader Caleb, our golden dreadlocked angel of the outdoors, explained the rules, asked us to introduce ourselves, and we set our intention. There were six of us, including Caleb. We ranged in age, background, physical fitness – from totally out of shape to American Ninja Warrior, with me somewhere in between. When it was my turn I explained that I had spent most of last year recovering from an illness. “So,” I confessed, “my intention is to make it halfway up the pole.” My zone of comfort usually includes massage, a cocktail, and a soft bed. The first woman in our group was fit, graceful, and looked like she spent her spare time performing with Cirque du Soleil. She asked me to take pictures of her going across and I watched with elation as she glided across that rope with elegance and ease. Ease! This could be done, I thought. We cheered her on. It was like watching the Olympics. She made it to the last rope and suddenly this group of people, whose names I had instantly forgotten post-introduction, were high-fiving each other and hugging as if we had been besties since high school. The rest of the group heard “awesome” and cheered me on with gusto. But I meant possum. I meant I was quite ready to curl up, play dead, and fall off the tightrope. The cheering became a collective whooping and whistling and next thing I knew my foot had gone rogue and stepped out on the rope. My whole body began to shake uncontrollably. I had both feet out on the cable, one hand with a death-grip on the pole and the other unsteadily reaching out toward the general direction of dangling rope. I heard Caleb calmly, but firmly, use one word: “reset.” And without direction or conscious knowledge of what I was doing, I found myself taking in a huge inhale through my nose and loudly exhaling out my mouth. So loudly that everyone below went silent for a brief moment. And, curiously, my body stopped shaking. I turned my head, thrust out my hand and caught the first rope. My support group of six went wild. In that moment, I learned that balance is more than not falling. That breath can cancel out fear. That camaraderie could push my foot past paralysis. I had figured out how to not fall if I stayed very still and didn’t move. But balance isn’t always static. It can also be dynamic, creating strength through momentum. On or off the Challenge Course, we figure out new ways to move forward, to face the unknown. As I let go of the rope behind me and reached for the next one, I left behind all thoughts of possum and pulled myself onto the path of the panther. That was a wonderful personal story and play-by-play of what the rope challenge course is like. Gooo panther!